The University of California Student Association passed a resolution at its meeting at UC Santa Barbara on Sunday calling for the university to divest from the firearm industry. The resolution — which passed unanimously — asks for transparency regarding the university’s external investments, for the UC Board of Regents to disinvest any current investments in firearm corporations and for the prohibition of all future investments in the gun industry. Although the university divested from firearm-related industries about two years ago, according to UC spokesperson Shelly Meron, the resolution demands greater transparency regarding the matter. After the shooting at Sandy Hook Elementary School in 2012, the university said it withdrew more than $35 million from Cerberus Capital Management, a private equity firm owning firearm companies that is one of the companies cited in the resolution, according to Marcy Straw, the executive director of the UCSA. Straw, however, said the university has not published a “statement or resolution” regarding the divestment. “Current information that is publicly available does not make it clear whether the university is still invested in gun manufacturers,” she said. Singh said that despite whether the university has divested, he hopes the resolution will produce a dialogue about these issues. 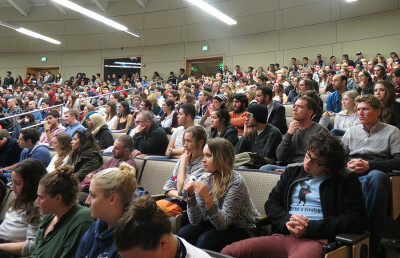 “If (the university) did, indeed, divest from firearms manufacturers and related companies two years ago like they say they did, then that means they agree divestment is an important tactic in social change,” said Caitlin Quinn, ASUC external affairs vice president and co-sponsor of the resolution, in an email. The resolution cites the “incredibly tragic” mass shooting of UCSB students in May of last year as evidence of the urgency of the issue. “As we have seen from the countless shootings that have happened throughout the nation, there is never the perfect time to discuss the topic of firearms,” Singh said. The UCSA resolution mentions university students’ history of campaigns to divest from corporations that “demonstrate a lack of accountability, ethicality and respect for the rights and dignity of others” to reclaim political agency and serve the constituents. At the meeting, the UCSA also discussed a resolution that calls for the implementation of a gender and sexuality requirement in general education and breadth courses. The resolution passed unanimously with amendments.